Represents a Data (Property) document. The DataDoc object is a member of the Documents collection that is available by the DataDoc property of the Application object. That collection contains all the DataDoc objects currently opened in QuickField. You can also get the primary DataDoc objects associated with the problem using the DataDoc property of the Problem object, or the secondary (library) one by the Library property. Property Description or Data documents are specific to types of analysis (Electrostatics data, Stress Analysis data, etc.) These documents store the values of material properties, loadings and boundary conditions for different part labels. The Data document can be used as a material library for many different problems. The DataDoc object inherits all the properties and methods of the generic Document class. Please see the IDocument class description to learn how to create a new data document or open an existing one, manage document's windows and other related topics. 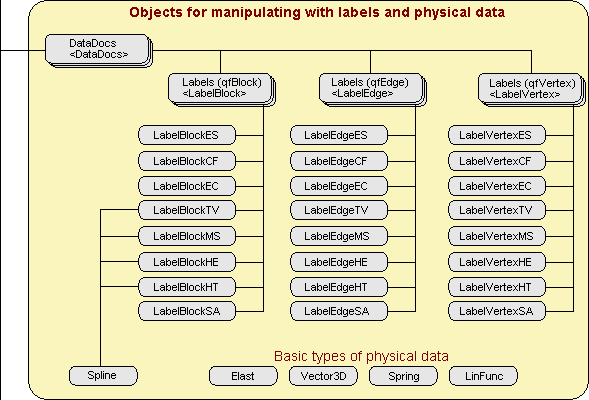 The Labels (qfBlock) property of the DataDoc object returns the collection of block labels that describe material properties and loads for subregions of the model. The Labels (qfEdge) property of the DataDoc object returns the collection of edge labels that assign specific boundary conditions to your model�s boundaries. The Labels (qfVertex) property of the DataDoc object returns the collection of vertex labels describng singular sources or constraints applied to points of your model. Each Label has an associated object containing physical data for it. It is accessible by the Content property of the Label object. The exact type of that object depends upon both the ProblemType and the Label's Type. In such situations when you do not need very specific details of physical data, you can use a generalized type of the label content object. These are: LabelBlock for block label, LabelEdge for edge label and LabelVertex for vertex label content.